A new biography of Orie O. Miller by John A. Sharp was initiated and partially funded by the Anabaptist Center for Religion and Society. At their May 11 meeting at Eastern Mennonite University, Miller's contemporaries will share stories of his life and celebrate the book release. 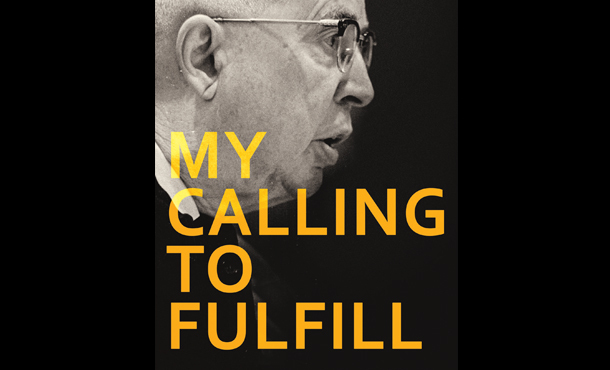 Orie O. Miller is a well-known name, but the reputation of this Mennonite lay leader, missionary, and businessman may grow, deservedly, in legend and stature with the publication of John E. Sharp’s long-awaited biography, “My Calling to Fulfill: The Orie O. Miller Story” (Herald Press). Miller was a “20th century leader, and considering his extensive leadership in his day in many, many church institutions and agencies, it’s important to introduce Miller to 21st century leaders,” says Lee M. Yoder ’63, steering committee chair of the Anabaptist Center for Religion and Society (ACRS), a community of Mennonite elders and scholars who meet monthly for fellowship and intellectual engagement at Eastern Mennonite University (EMU). The biography, six years in the making, was initiated and partially funded by ACRS. Other funders include the Brethren in Christ church, and two organizations that Miller helped found, Mennonite Central Committee and Mennonite Economic Development Association, known commonly by the acronyms of MCC and MEDA, respectively. At the ACRS May 11 Annual General Meeting, a handful of Miller’s contemporaries will share anecdotes and stories about this consequential man who, from his first pioneering trip as a relief worker to Russia in 1919, forever changed Mennonite education, business, relief work and peacemaking. The meeting, which begins at 7:30 a.m. with coffee and pastries in the west dining room on the EMU campus, is open to the public. Born in Indiana in 1892, Miller attended Goshen College before answering the call to engage in relief work in 1919 and shortly after, helping to form MCC, for which he served in various capacities, including executive secretary, from 1921-1963. Miller helped to engage and steer Mennonite values and ministry into a global perspective, while integrating sound business and organizational principles. Seeing a need often meant forming an organization to meet that need: Miller was the motivating force behind the founding of many Mennonite organizations, including Mennonite Mental Health Services, Mennonite Indemnity, Mennonite Mutual Aid, Mennonite Travel Service, and several others. Hundreds of young men were indebted to Miller – and had their lives changed forever – because of Miller’s creation and administration of Civilian Public Service, the alternative to military service that allowed conscientious objectors to fulfill their civic responsibilities. Miller married into the shoe manufacturing business and ran it with acumen and dedication throughout his life. Yet “to the end his life, he maintained his vision for service, never allowing his considerable wealth to determine his needs,” Gingerich said, adding that Miller could have easily afforded a Lincoln Continental, but instead drove a Ford Falcon. Miller died in 1977 at the Landis Retirement Home in Lancaster, Pennsylvania, yet another enterprise he was instrumental in founding and supporting. A standard feature of the ACRS Annual General Meeting is a time to discuss the group’s ongoing work and vision. At one of those times, many years ago, members noted the need for a comprehensive biography of Miller that would address the full range of his personality and involvements not covered in a previous 1969 biography by Paul Erb. Another inspiration for the Miller project was the work of the late Albert N. Keim ’63, professor emeritus of history at EMU and an ARCS member. Keim’s biography of Harold S. Bender, a professor of theology at Goshen College and Goshen Biblical Seminary, was published in 1998. “Harold Bender was tremendously influential on theological matters in the same way that Orie Miller was tremendously influential in shaping Mennonite influence today,” said Vernon Jantzi ’64, ACRS interim director. Miller’s accomplishments as a leader are widely recognized. EMU houses an Orie Miller Center, which promotes interdisciplinary activities and scholarship modeled after the man’s visionary integration of business, mission, development, education, justice and peace. In addition, EMU, ACRS, Mennonite Central Committee, and Mennonite Economic Development Associates are in the early stages of planning a leadership conference at EMU in early April 2016 that will highlight Miller’s leadership within the Mennonite church, according to Jim Smucker, vice president and dean of the School of Graduate and Professional Studies. Editor’s note: In April 2015, the Pax program was chosen as the recipient of the annual Gandhi Center Community Service Award. To read about this event, click here.